Biology is a comprehensive introductory biology textbook that covers biology in a traditional order, from the structure and function of the cell to the organization of the biosphere. The book centers on the evolution and diversity of organisms. 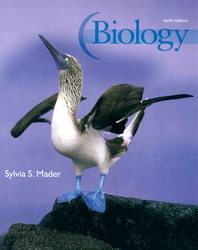 It's no wonder that Sylvia Mader's Biology continues to be a text that's appreciated as much by teachers as it is by the students who use it. NEW! Key content updates based on biological discoveries are found throughout the tenth edition. NEW! All text, artwork, and photos necessary to understand a particular concept (e.g., prokaryotic vs. eukaryotic replication) appear either on the same page or facing pages. The highly acclaimed artwork in Biology has become the hallmark of this flagship text. The creative paging process retains the functional page spreads but enhances the role of art and photos in creating the most effective and appealing pages possible.